The range of shot blast media that can be used covers all non hygroscopic media from very abrasive materials, e.g. aluminum oxide or silicon carbide to plastic media and corn cob. With the Rösler SA 1400 rotary indexing table machine, targeted, careful, non contact finishing of different kinds of components and variable capacities is possible in the same machine. The entire spectrum of blasting applications ranges from delicate deburring to shot peening. The installation is particularly interesting for applications in which the entire surface of the components need not be blasted, but rather only in specific places. The concept of the SA 1400 is based on a modular system and can be equipped with 6, 8, 10 or 12 satellites operated completely automatically. The machines can be equipped both with injection and pressure blasting system. The basis forms a highly wear-resistant, perphorated and fabric re-inforced transport belt, made of rubber. In a continuous passing through process the components are treated by 24 injection nozzles altogether, which are fixed on an adjustable support frame. By the vertical lifting movement of the frame and the free adjustment of the nozzles, it is also possible that complex component forms can be pentagonally blasted. All commercial blast media can be used. This type of Rösler continuous flow shot blasting machine is ideally suited for treating small, high volume bulk components. The special design of the V-shaped loop belt creates a screw like movement of the parts through the machine, which ensures even treatment of all parts. The SBI shot blasting machines have been designed for applications where the blast media required does not permit the use of the more economic blast wheel. 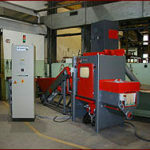 The machines are suited for bulk processing applications such as cleaning iron or steel castings, roughening aluminum springs or shot-peening of thermoset products. The Tumble Belt Batch Machine – Injection System is equipped with a perfect pressure system including several nozzles. The multiple of nozzles reduce the processing time. Burrs from grinding the surface of synchronous rings can efficiently and completely be removed using this type of shot blasting machines. The swing table with two satellites accepts interchangeable holders for differently sized rings. Because of the swing table there exist no manipulation down time. Automated handling can be integrated with this system.